I am a freelance writer with a passion for art, photography, cooking, yoga, dancing and travelling. I have an Eastern European background and I love to explore new cultures, discover new things and share my experiences with the world. If the idea of having freshly baked bagels with great coffee appeals to you than Huff Bagelry is definitely worth paying a visit. 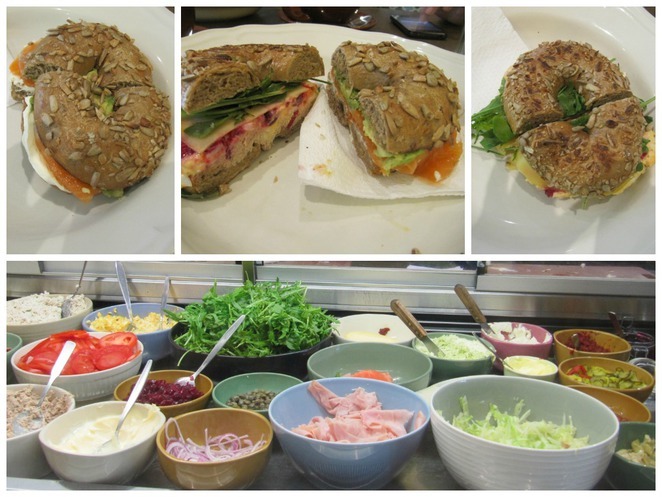 It is open daily for breakfast, brunch and lunch, as well as for purchasing unfilled bagels to take-away. The cafe is conveniently located on Koornang Road in Carnegie which is a great place for grocery shopping – here you can find a Russian deli, Asian and Indian grocery stores, a few fruit and vegetable markets, butcher shops, bakeries and a Safeway supermarket. Parking is available along the street as well as behind the cafe. Huff Bagelry's modern interior design plays a key role in creating a lively and cosy atmosphere. The frameless windows allowing the sunlight to spill in, wooden benches and soft couches, and menu of the day written on a blackboard with chalk are the highlights of the décor. There are a few spots located outside which can be pleasant on a sunny day. It gets quite busy on the weekends so try to get in early because the bagels can run out really quickly. The best sellers are wholemeal and rye bagels but poppy seed, sesame seed, and original bagels are also very popular. For those who want to try something unusual- there are blueberry, choc chip and cinnamon & raisin bagels on offer. Mini bagels as well as mini pizza bagels are available for the kids' delight. The menu may seem limited because it is entirely based on bagels, however the selection of bagels types and bagel toppings is extensive. As shown on the blackboard there 10 different options of fillings with a bagel of your choice. It is possible to add or remove ingredients or even create your own combinations. My personal favourite is #7 with beetroot on a whole meal or rye bagel. The smoked salmon, cream cheese and avocado which is a variation of #1 is also an excellent choice. The coffee deserves a special mention. Surely Huff Bagelry can top up the list of the Best Bagels in Melbourne but I think it is also worthy of appearing on the Best Coffee in Melbourne list. Latte, cappuccino and even baby chino never disappoint. For those who do not know the baby chino is a cappuccino for kids as it is made of frothed milk but without any coffee. My nephew had his first baby chino there and he enjoyed it so much that he asked for seconds. On a final note, when I first discovered Huff Bagelry I hoped it would open in other places/suburbs as well so that I could enjoy my favourite # 7 with beetroot wherever I am. However, I realised that Huff Bagelry being a local bakery and not a franchise outlet is what makes it special, individual and authentic. What are the Best Free Education Websites? It is amazing ho many ingredients they manage two wedge between two slices.